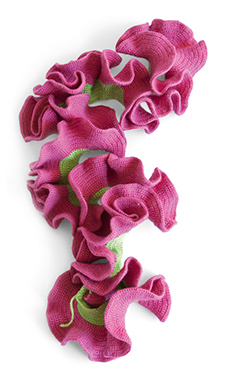 Crochet Coral Reef: CO2CA-CO2LA Ocean, an exhibition by Margaret and Christine Wertheim and the Institute For Figuring, is an artistic response to the environmental crisis of global warming and the growing problem of plastic trash accumulating in the ocean. Melding mathematics, marine biology, handicraft, and community art practice, it spotlights not only the damage humans do to the earth's environment, but also their capacity for positive action. The exhibition is designed to bring people together to embrace a devastating ecological challenge: the survival of coral reefs and marine ecologies throughout the globe. 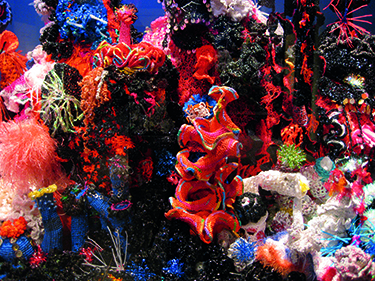 Presented by the Mary Porter Sesnon Art Gallery and the Arts Division’s Institute of the Arts and Sciences, Crochet Coral Reef: CO2CA-CO2LA Ocean will open at UC Santa Cruz on February 10, running through May 6. 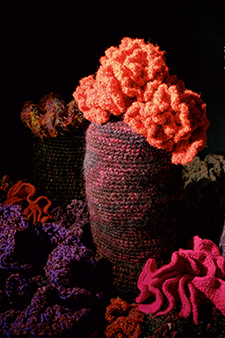 The Werheim’s Crochet Coral Reef project has been exhibited in art and science museums worldwide, including the Museum of Art and Design (New York), the Andy Warhol Museum (Pittsburgh), the Hayward Gallery (London), the Science Gallery (Dublin), and the Smithsonian's National Museum of Natural History (Washington, DC). An opening public reception will take place in the gallery on Friday, February 10, from 5 to 7 p.m. Prior to the reception, Christine Wertheim will present an artist talk at 4 p.m., at the Digital Arts Research Center (DARC 108). The public will also have a chance to meet the artists at the gallery on Saturday, February 11, from 2 to 4 p.m.
Weber noted that like coral colonies themselves, the Crochet Coral Reef is a product of collective, rather than strictly individual, efforts. For more information about the exhibition, contact the Mary Porter Sesnon Gallery or call (831) 459-3606.